Audi has long been associated as a premium car brand, mostly for their lineup of sedans and sports cars. 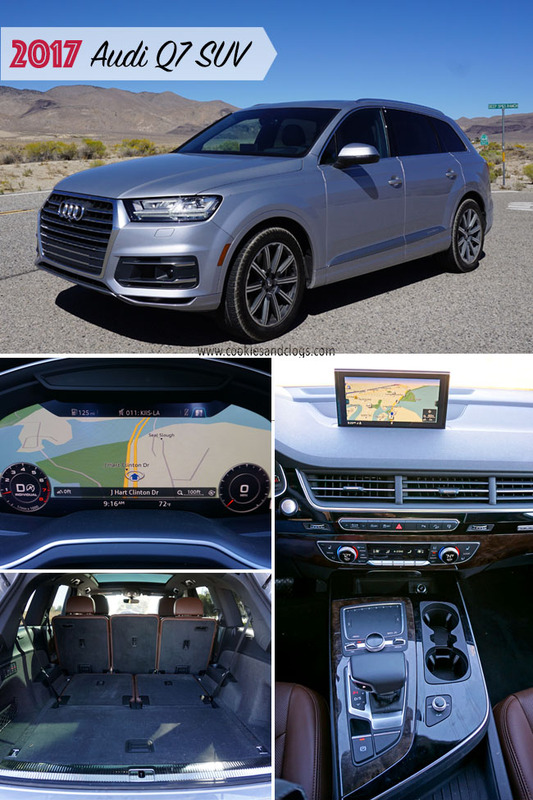 But, the 2017 Audi Q7 has definitely carved a nice spot for itself in the family SUV segment. While I’m not thrilled about the exterior design, I was blown away by the functionality, features, and performance. There are some issues with the Q7 but these don’t take away from the fact that this is a quality vehicle. While I usually love the sleek and stylish designs coming from Audi, the Q7 looks quite boxy and dated to me. It just lacks that finesse and smooth finish that I’ve come to expect from the company. Inside, though, there are nice finishes throughout with high-quality materials. 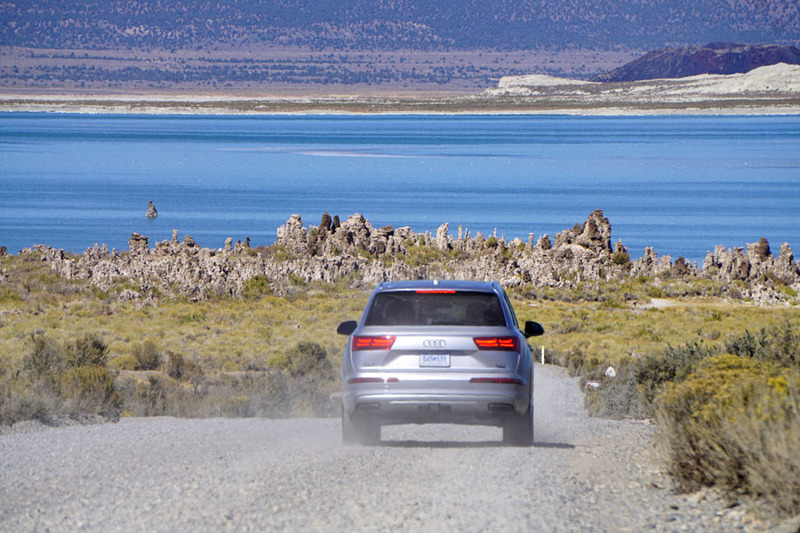 With a 3.0L 6-cylinder engine and quattro all wheel drive, the Q7 is a powerhouse. A Towing Package will allow owners to pull up to 7,700 lbs. It even has an all terrain and off road drive settings! 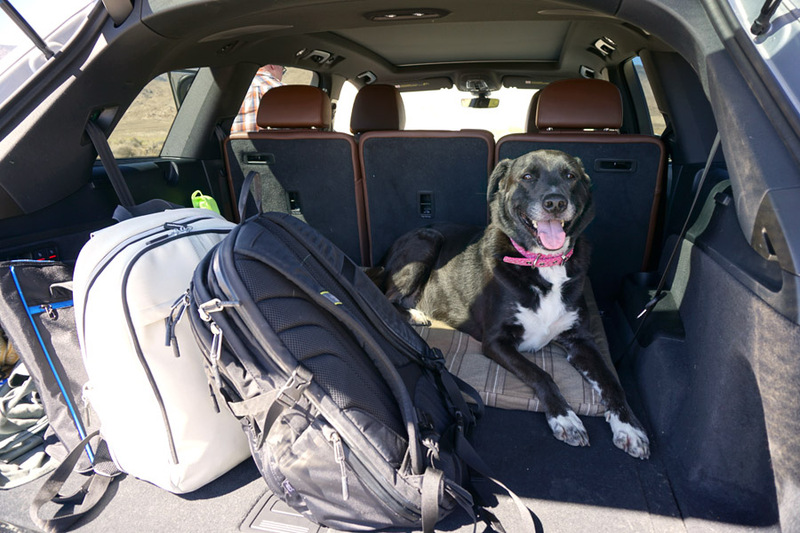 This was perfect for taking on unpaved dirt roads during our family road trip through Mono County, CA! The drive was smooth but does lean toward a tighter suspension. There is some noise that comes through the cabin but it’s not bad. Handling was good and it had a decent turning radius. The Q7 asks for Premium fuel but the gas tank holds 22.5 gallons so at least you won’t have to fill up that often. The 21 mpg is not bad for a vehicle of this size and with this much power. 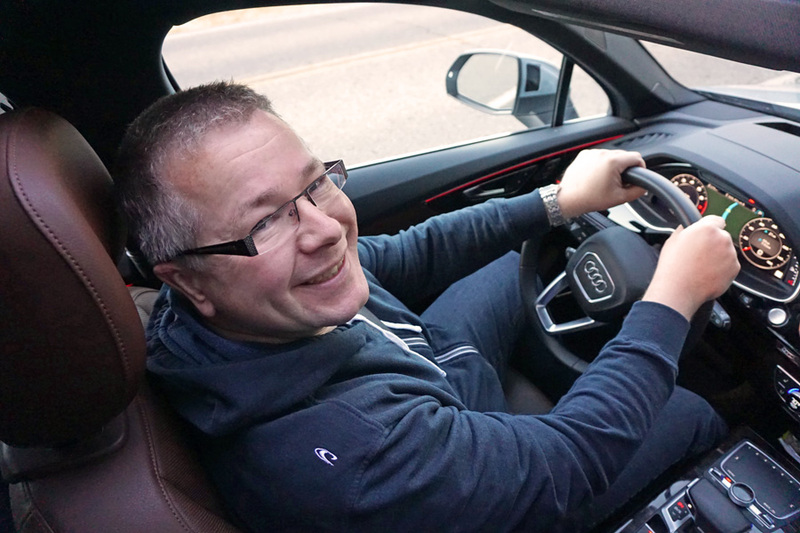 Though the Q7 does feel big at first, it’s easy to maneuver and you get used to driving it quickly. With all the bells and whistles this model has loaded on it, one week was in no way enough time to try them all out! 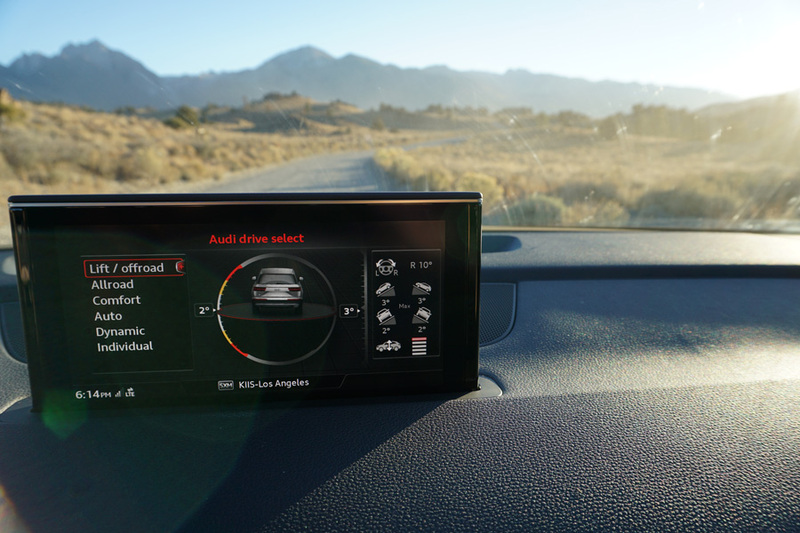 Auto-dimming high beams, rain-sensing wipers, road and sign sensors, electric steering wheel (to adjust tilt and telescoping), dash projection, and all-digital display were just some of the highlights. Love, love, LOVE the 360 degree camera views. I get nervous about pulling too close to curbs and scratching rims so this feature saves me a lot of stress. We also used this to pull right up to the edge of the wall or hedge when parking in tight parking lots. The keypad input didn’t do it for me and seemed like a waste of space, despite it sounding like a cool feature. I also found the placement of the drive select modes awkward. If you have to change it regularly (while driving on varying road types), it’s not convenient. Instead of several 12V cigarette lighter outlets, more quick charge USB ports would be better for families. In case you’d like to install some rear seat entertainment, the Q7 can come pre-wired. As for seating, you can fit a total of seven passengers. The front seats are comfortable and roomy. With me being 5’ 3” and Frans being 5’ 11”, the 4-way lumbar support (that also adjusts up and down) made the ride that much better. The second row has plenty of head, hip, and leg room. 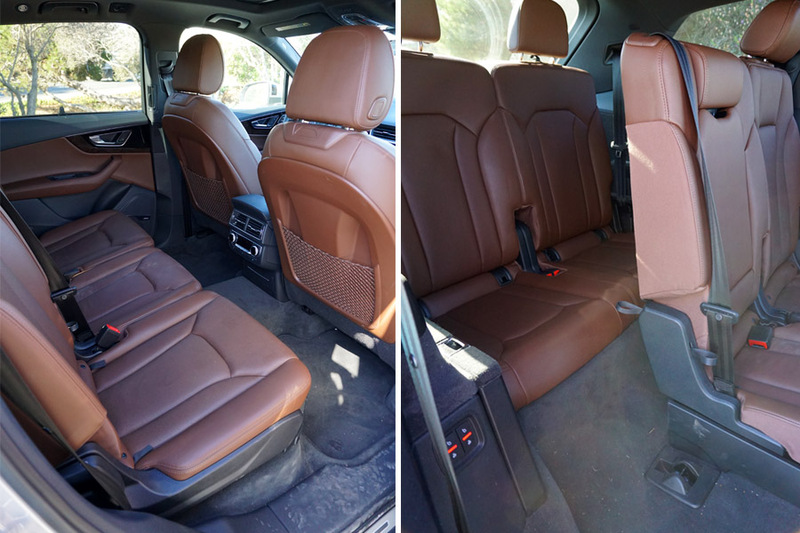 A wide middle seat means you can fit an adult or a small booster between two full-size car seats. Passengers in the second row will appreciate the 4-zone climate control. You can move the second row seats up to allocate some leg space to those riding in the third row. “Some” meaning that it’s still super tight. You should know that the third row is tight and takes some skillful contortion work to get in and out. In the cargo area and near the rear doors, you’ll find controls for the power-folding third row. It’s so nice not having to strain to get those seats up and down! There are also controls in the cargo area to lower the back of the vehicle for easier loading. With the third row up, there’s still room for groceries, sports equipment, or a stroller. But, there’s not enough space for your dog. We kept the third row down so Speckles wasn’t so squished and had room to turn around. 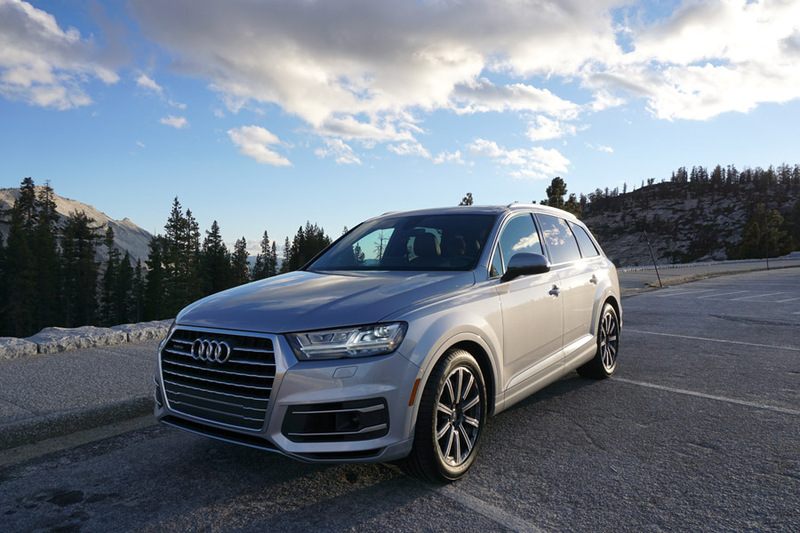 The 2017 Audi Q7 really surprised us. It was an enjoyable SUV to drive and fits the needs of most families. Even though there are many tech features, these are carefully chosen and not overwhelming at all. 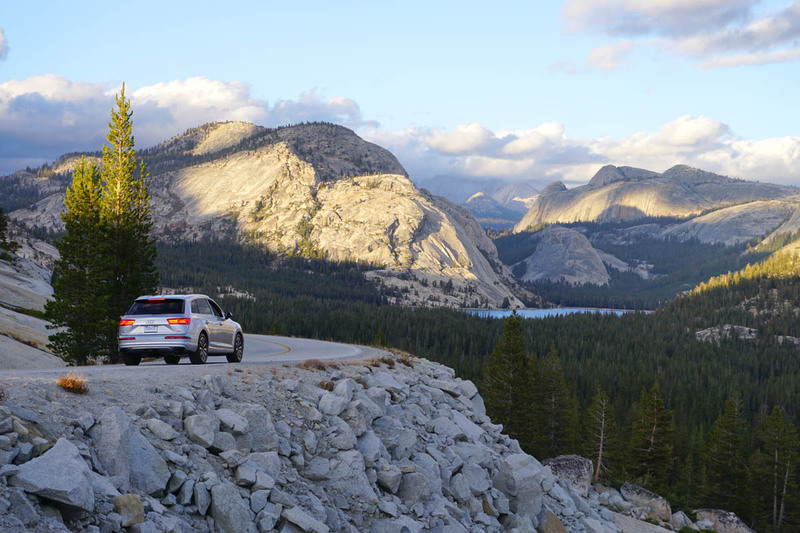 Also, despite quality materials and driving performance, the Q7 still feels rugged enough for everyday use. This is a great choice as a family SUV, even if it fall on the pricier side.